I have been checking out a number of the different craft subscription services available. The most recent one that I reviewed was the Koala Crate that is for ages 3 to 4 years old. I have also previously reviewed Kiwi Crate that is for ages 5 to 8 years old. This month we are checking out Kiwi Crate once again. The last time we checked out Kiwi Crate we were pretty darn impressed. This month we checked out the Magic Kiwi Crate box…..
*Everything you need is in the box. *The quality of the items in the box is great. *The projects, or activities are interesting and engaging for kids. *Kiwi Crate’s activities encourage your kids to be crafty and creative. *I find that the themes are interesting for kids. *The kits can be completed by kids without the need for assistance. 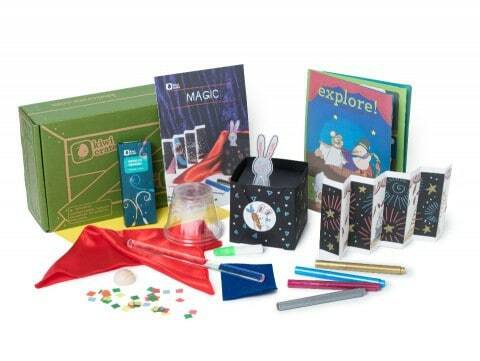 *The kits encourage reading, discovering, creating, and more. As you can see, there is a lot that I love about Kiwi Crate. My Little One also loves Kiwi Crate. She loves seeing the crate arrive, knowing that it is full of craft fun to explore. I always find that my Little One explores beyond the crate. 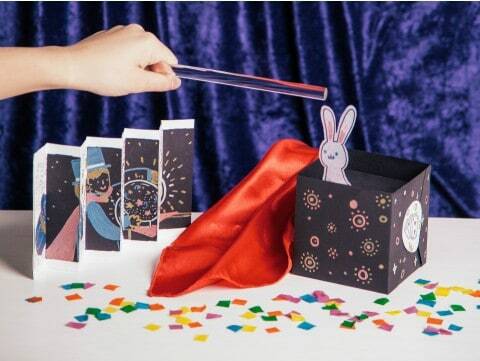 What I mean by that is that the theme of the crate gets her mind working so that she then does the activities in the crate, and then continues exploring the theme, in this case Magic, once the crate activities are done. I love that. You can shop the Kiwi Crates and do a one time purchase of an available crate that you like, or you can sign up for various subscriptions packages. Both my Little One and myself love Kiwi Crate and give it our stamp of approval. The quality right down to the crate itself is awesome and the activities are fun, and engaging for kids. Remember to join the Kiwi Crate Newsletter for 30% off. Disclosure: MomMomOnTheGo was provided product for the purpose of conducting this review. As always, MomMomOnTheGo only supports companies, products, and services that she loves. Please note that there are affiliate links within this review.